Ask any knowledgeable reader who was Roger Zelazny and you’ll be told he was a brilliant science fiction writer who won six Hugo Awards during his career. Which is why when the late author’s agent uncovered an unpublished manuscript the surprise was not so much in it’s discovery as the fact that it was a crime thriller. There is even some doubt as to when the book was written, although the author’s son, believes it was produced in the early 70s. THE DEAD MAN’S BROTHER is a mystery thriller that moves across three continents and embroils its hero in murder, embezzling, espionage and militant revolution. Ovid Wiley is a respectable New York art dealer with a criminal past. When an old associate shows up on his gallery floor dead, Wiley soon finds himself a pawn for the C.I.A. He is sent to Rome to investigate a missing priest who has stolen millions of dollars from the church. Wiley soon learns the man has been murdered and then barely escape a hit on himself. When he discovers that Maria, another face from his criminal past, was the priest’s mistress, things begin to get complicated. 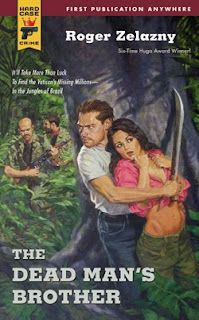 Eventually Wiley, with Maria in tow, is forced to fly to Brazil in search of the dead man’s brother, the leader of a group of anti-government revolutionaries. Although the book has many twists and turns, Zelazny was a competent storyteller and he never loses his main plot, dropping just enough clues to keep the reader following the bread crumbs along with an often-times befuddled Wiley. This is not the best such book I’ve read and there were places I wished the author would have quickened the pace. No writer ever wants to limit his or her range and that Zelazny had a crime book in him is no surprise. Still, it comes nowhere near the originality and daring of his science fiction work, in which he excelled. In the end, neither a success or failure, THE DEAD MAN’S BROTHER seems a personal experiment he needed to get done, which I suspect is why he never pushed getting it published. Thus it now surfaces as a literary oddity and that may truly be it’s only worth. Every now and then a book comes along that you know was somehow written solely for you. 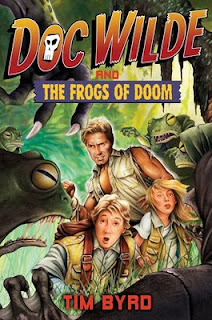 Such is the case with this wonderful fantasy adventure from John Marco. 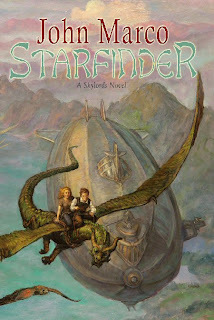 He has masterfully taken my love of airships and woven them into a story that pits mankind and its sciences against the magic of wizardry and a fantasy world inhabited by very familiar mythical creatures. Moth lives in high atop the cliff city of Calio and dreams of one day flying a dragonfly, the single-seat aircraft of the Sky Knights. Moth is an orphan being raised by an old airman named Leroux who spins tales of the fantastic world beyond the Reach. The Reach is a fog enshrouded no-man’s land from which only a handful of explorers have ever returned. Leroux’s yarns tell of beings called the Sky Lords who rule the land beyond the Reach and claim the skies for themselves. When Leroux dies, he leaves the boy a strange navigational device called a Starfinder and a charge to go into the Reach and save Lady Esme, his Kestrel Hawk. Leroux claimed the bird was in actuality a Sky Lord Princess who had been cursed by the King of the Sky Lords because of her love for Leroux. Moth, using the Starfinder, must find a dragon wizard named Merceron who will help Lady Esme regain her true nature. Fortunately for Moth, he has a courageous ally in Fiona, the fiery red-headed granddaughter of Calio’s governor, Rendor. What neither of them is aware of is that Rendor was Leroux’s companion during that long ago expedition into the Reach and that he wants the Starfinder. The Starfinder possesses unique arcane powers that, in the hands of the Sky Lords, could enslave the human world. When Rendor learns Moth and Fiona have fled into the Reach, he immediately organizes a search and rescue operation aboard his newly built, massive airship, Avatar. Among the military cadre under his command is Moth’s closet friend, Sky Knight pilot Captain Coralin. From the first page to the last, this book weaves an incredible tale filled with truly amazing characters; beautiful mermaids, wise dragons and brave warrior centaurs. Each is brought to life with deft, sure strokes and the story propels itself gracefully along much like the giant airship at its center. Before Moth and Fiona can achieve their goal, they will have to grow up fast, face many dangers and bear the heartache of sacrifice and loss. STARFINDER stands leagues above similar fantasy books. It is the first of a new series and if subsequent sequels are this good, then sign me up now. This is a journey this airman is very eager to get started.